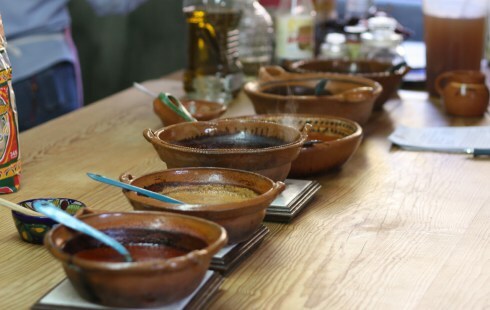 One of my goals in San Miguel de Allende was to take a cooking class. San Miguel has plenty of those, but I wanted something intensive — a place where I could seriously discuss the food and explore some basics that I hadn’t yet grasped in my Thursday night cooking class. A while back, Rachel Laudan had recommended a woman named Marilau in San Miguel. Marilau’s website was impressive: she had a techniques class that taught how to capear and how to clean nopales, and another called the ABCs of Mexican cooking that taught salsas, moles, pipianes and adobos. The latter sounded perfect for me. Luckily she had availability, and at my request she graciously squeezed the normally four-day long class into two days. On the first day — salsas and adobos — I showed up at 10 a.m. to a clean, comfortable room in a house in Col. San Antonio. I thought we were going to start cooking, but instead Marilau started the class with a short lecture about dried and fresh chiles. She explained that it’s not okay to mix dried and fresh chiles, and that even mixing two types of fresh chiles in a salsa no-no. When I asked why not, she said it ruins the salsa’s balance. “Sabes la palabra cacofonía?” she asked. Do you know the word cacophony? I nodded. 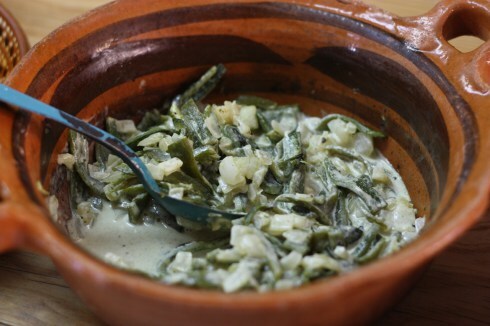 A few minutes later, she presented me with a bowl of anchos, guajillos and pasillas. “Go ahead, toast them,” she said. I placed several chiles on the comal. This was exactly the kind of information I’d been hoping for. How to toast a chile was something my Thursday-night cooking class instructors had glossed over, because they assumed everyone already knew how to do it. And most students did, in fact. Most grew up watching their Mexican mothers or grandmothers cook, and some operate food stands. Over the next two days, it was exactly those kinds of secrets that I learned — the proper way to toast a chile, to remove its seeds, how to fry a chile and how much lard to use in the pan. I learned that green salsa isn’t as tart after it’s been cooked in a pan, and that cilantro stems should always be used, because they’re the most flavorful. The final product was not even the best part. She taught the pipianes and the moles in a way that showed how the flavors played off each other, and how they stacked together to create this complex sauce. 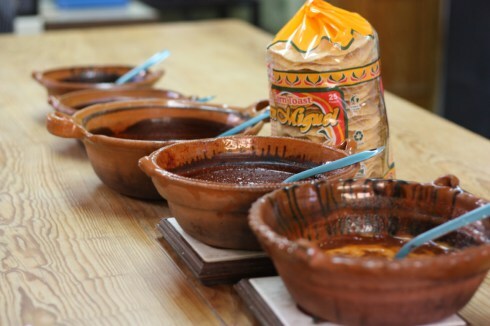 We would grind each item individually — fried tortilla, nuts, spices — and add it to the pot, and then taste. I had no idea that ground, fried tortilla could be used as a spice, but that’s what it really was. I also didn’t realize how much a handful of ground raisins could change a mole sauce. I wish I had more photos to show you, but I was so busy cooking that I didn’t take many pictures. I’m hopefully going to go back this fall to take a few more classes. If you’re serious about learning Mexican food, you should really seek out Marilau. She is a fantastic resource.